Egenes chooses to begin their journey on the West Coast rather than the East Coast. 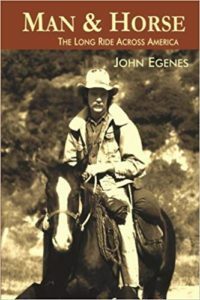 He writes, “...because we are traveling west to east and crossing great deserts first, we will become hardened to the trail, rough and feral, and adopt the attitude ‘it’s us against the world.’” (pg. 24) This proves to be the right decision, as “...the eastern part of America is fenced and tame. There is no open country, no place to spend days and weeks by yourself.” (pg. 24) He goes on to explain that had they begun in the reverse, they would not have achieved the complete isolation they did until much later in their journey and would have emerged from the challenge far different than they did.